In 1996, Los Angeles County's Community Redevelopment Agency provided grants to individuals, commissioning public art projects to enhance downtown's city landscape. Michael Tansey's proposal of the "Daffodil Metamorphosis" was selected as one of these projects, receiving a $20,000 grant to take one of the city's unused air raid sirens and turn it into a modern art piece. Michael Tansey's cast aluminum and steel sculpture is a creative renovation of a 34-foot tall air raid siren used during the Cold War to warn civilians of a pending nuclear attack on the city. The bright yellow flower blooms from below the base of the siren, shining a positive and contradictory light onto the decaying history of the fear of nuclear annihilation. Although both nuclear weapons and this metal flower were man-made, the daffodil, chosen for its tradition of being the first flower to bloom in spring, highlights the potential for a brighter future to come out of the once ominous symbol of the possible end of civilization. Aerial view of the daffodil's original location. 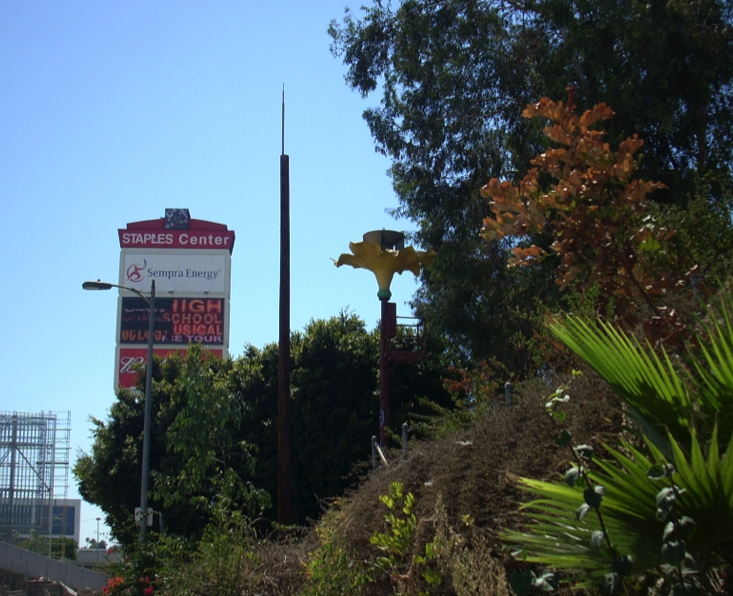 Originally placed at the corner of Figueroa and Olympic, it marked the south edge of the city's development within the ring of the 10, 101, and 110 freeways. It was taken down during the construction of L.A. Live. Ironically, only a few years after it was installed, the city removed the art project, laying it on its side for four years in an empty field. Daffodil Metamorphosis is again on view at its current home on Cherry Street, on the left side near the 110 Harbor Freeway, at the end of the dead-end street of the public parking garages. With the reopening of Cherry and the opening of the access way that runs between the J.W. Marriott's ballrooms and the west parking garage, view of the sculpture has recently been restored. Whether this is a temporary or permanent home remains unknown. Even though the City of Los Angeles supported the reworking of a landmark, which once indicated a haunting memory of the Cold War in Los Angeles into a site for thoughtful consideration of the future, it seems that the city hasn't fully embraced this reminder of a costly and unneeded infrastructure. The question remains whether or not the public, as well as the city, can see beauty in the remnants of the Cold War. Even if more pieces of this history are restored or conserved, will any attempts made ultimately see the Cold War becoming more hidden within its landscape?